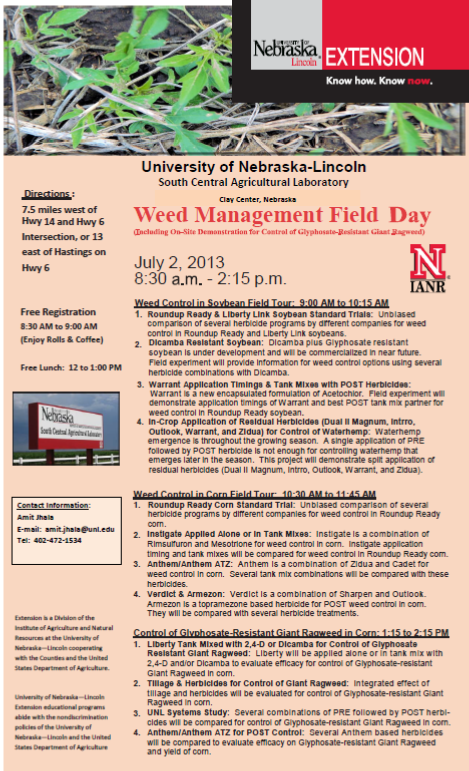 Hope to see you at this weed science field day at UNL’s South Central Ag Lab near Clay Center on July 2nd! No charge. Please RSVP to (402) 762-4403. More information at: http://scal.unl.edu. Posted on June 20, 2013, in Crop Updates, Event and tagged Agriculture, corn, Crops, Extension, farm, farming, Nebraska, Plants, Science, Soybeans, Yield. Bookmark the permalink. Leave a comment.